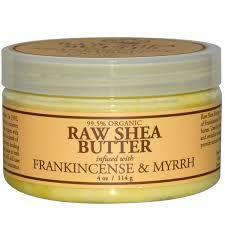 Our Raw Infused Shea Butter w/Frankincense & Myrrh is nutrient-rich, long-lasting moisture treament. This healing blend is infused with Vitamins E and B-5, Soy Milk, Jojoba Oil, Cocoa Butter, and Macadamia Seed Oil as well as special essential oil blend of Frankincense, Myrrh, Cardamom, Ginger and Black Pepper that adds an aromatic experience and skin-healing properties. Frankincense is known for its toning and anti-aging properties and adds aroma therapeutic benefits promoting mental strength, clarity and balance while Myrrh is known as a superior cosmetic in early remedies and helps to heal chapped skin. Helps to relieve eczema and psoraisis.